A scuba diver suit might be the costume to wear this Halloween as rain targets areas from the upper Gulf coast to the Great Lakes and in the Northwest. 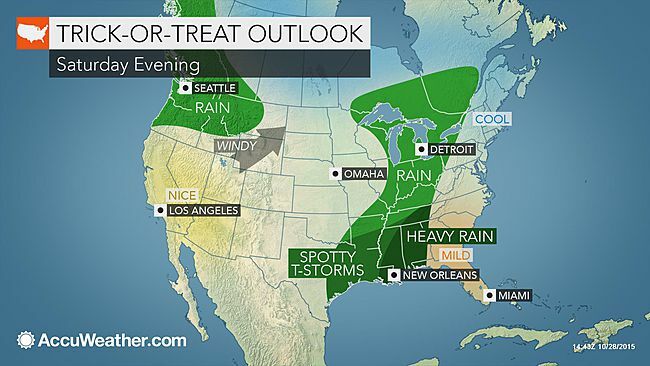 Trick-or-treaters in more than a dozen states should be prepared to get wet on Saturday. According to AccuWeather Senior Meteorologist Kristina Pydynowski, "Two separate storm systems will be responsible for the rain Saturday evening that threatens to play a trick on Halloween festivities or cause rain gear to be added to costumes." A complex storm system will push east of the Great Plains and into the lower Mississippi Valley to the Great Lakes region on Saturday. Rain will drench a large part of this area into Saturday night. "An exception may be in part of the Ohio Valley, where rainfall will be more sporadic compared to areas farther to the north and to the south," Pydynowski said. In parts of the South, thunder and lightning will add to the spooky conditions. Rain falling on saturated ground in the Deep South and fallen leaves blocking storm drains farther north will contribute to the risk of urban flooding. "The heaviest rain will focus on the corridor from eastern Louisiana to southeastern Tennessee," Pydynowski said. "This includes New Orleans, Birmingham, Alabama, and Chattanooga, Tennessee. Localized flash flooding is a concern from the heaviest downpours with the ground recently saturated from Patricia." Motorists are urged to slow down due to the dark and rainy conditions that will reduce visibility and make roads slick. Be sure to wear reflective clothing and carry a flashlight or glow stick. Fallen leaves will make roads and sidewalks extra slick in some locations. For those heading to Halloween parties or parents shuttling their kids around town, be alert for flooded roadways. Do not attempt to drive across roads that are underwater. At the very least, there will be extensive and deep puddles. Waterproof shoes or boots would be a good idea along with a plastic rain poncho or umbrella. Though the Northwest is in need of rain, due to the prevailing drought conditions, the timing of the wet weather may foil the Halloween masquerade. A series of storms will continue to roll in from the Pacific Ocean and into the Northwest through the weekend. Each storm will bring rounds of drenching rain and stiff winds to much of Washington and Oregon, as well as northernmost California, much of northern and central Idaho and western and central Montana. The combination of rain and wind will make it difficult for many youngsters to keep dry. Similar to parts of the Midwest and South, enough rain can fall to cause flash and urban flooding. Where leaves have begun to fall, roads will be extra slick. Fog could also pose a serious problem for motorists. While rain, flooding and fog will make trick-or-treating difficult in the parts of the Central and Northwest states, millions of kids and their parents can expect the weather to cooperate this Halloween. The weather in the East will be dry with typical chill in the Northeast and jacket-free conditions for much of the Southeast. Following rain on Friday, most areas from central Texas to the Dakotas and much of Minnesota will also be dry or will be drying out on Saturday evening. However, the Pacific storms will pose a problem to the lee of the northern Rockies. "Winds can be strong enough to down some tree limbs in parts of Montana and Wyoming on Saturday evening," Pydynowski said. "The wind may gusty enough to have some kids holding on to their costumes as far east as Minnesota and Wisconsin." A dry evening is in store from Wyoming to New Mexico, westward to much of California. Light winds are forecast in Southern California following a Santa Ana event during the week. Parents and kids should still wear reflective clothing and carry a flashlight as there will likely be insufficient illumination from the moon in a waning gibbous phase. With Halloween falling on a Saturday this year, most communities will have trick-or-treat night on the holiday itself. Check your local AccuWeather.com forecast page if trick-or-treating in your community falls on a night other than Saturday.